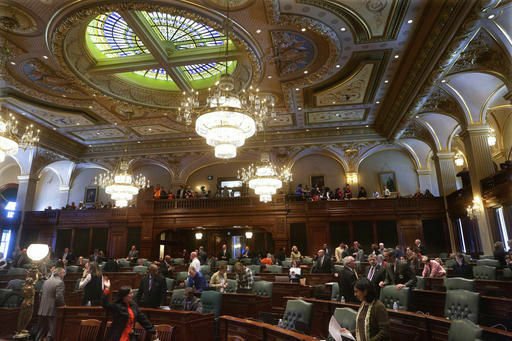 SPRINGFIELD — The Illinois House voted Thursday to override Gov. Bruce Rauner's vetoes of a budget package, giving the state its first spending blueprint in more than two years and ending the nation's longest fiscal stalemate since at least the Great Depression. The budget is retroactive to July 1 — the start of the fiscal year. That's the date a permanent 32 percent tax increase takes effect. Individuals will pay 4.95 percent instead of 3.75 percent. The corporate rate jumps to 7 percent from 5.25 percent. Among Central Illinois Republican lawmakers, none voted to override the vetoes except for Bill Mitchell, R-Forsyth. Rauner vetoed the measures because he sees no indication that the Democratic-controlled Legislature will send him the "structural" changes he's demanded. Those include a statewide property tax freeze, cost-cutting restrictions on compensation for injured workers, changes to pension benefits for state employees, and reforms making it easier for voters to merge or eliminate local governing bodies. The standoff has had potentially disastrous side effects. Credit-rating houses threatened to downgrade the state's creditworthiness to "junk," signaling to investors that buying Illinois debt is a highly speculative venture. The bond houses predicted a downgrade without a fix by the July 1 start of the fiscal year — the third consecutive fiscal year Illinois has opened without an approved budget plan. But Fitch Ratings and S&P Global Ratings gave Illinois some breathing room on Monday, issuing notices marking the House tax increase approval a day earlier and indicating they wouldn't take immediate downgrade action. Government has limped along for two years on the strength of court-ordered spending, but the state comptroller says the treasury will be $185 million short of what's needed to cover basic services by August. With a $6.2 billion annual deficit and $14.7 billion in overdue bills, the United Way predicts the demise of 36 percent of all human services agencies in Illinois by year's end. Billions of dollars in road construction work is shutting down. Public universities have been cut to the bone and face a loss of academic accreditation. The budget bills are SB6 and SB9. After weeks of crafting legislation behind closed doors, Senate Republican leaders today unveiled legislative text that lays out their proposal to repeal and replace the Affordable Care Act and significantly reform the federal-state Medicaid program. Known as the Better Care Reconciliation Act of 2017, the Senate proposal reflects many of the same policies that garnered narrow House approval last month, but makes significantly deeper cuts to the federal Medicaid program. Lawmakers, advocates and other health care stakeholders will now have only one week to analyze and consider the proposal before it comes to the chamber floor for an anticipated vote next week. The non-partisan Congressional Budget Office (CBO) is expected to release its analysis of the measure very soon, and because the policy process used to move this health care reform proposal through Congress requires only a simple majority for passage, Senators will only need to secure 50 Republican votes to approve the bill (with Vice President Mike Pence as the tie-breaking vote). If the Senate’s proposal passes the Senate, it will need to go back to the House for consideration before being signed into law. While we have heard some preliminary concern from some Republicans in the House, as of right now, we expect that the House would ultimately approve the measure. The time to act is now, and advocacy on this important issue cannot wait. Earlier this week, n4a released our #SaveMedicaid campaign with tools and resources that Aging Network leaders and stakeholders can use to support your state advocacy efforts. Advocacy is particularly important if you live in the key states of ME, OH, WV, CO, AK and AZ. While n4a and other health care and aging advocates will need time to comb through the proposal, overall, the Senate bill largely tracks the House approach to health care reform. Some key differences—especially as they relate to restructuring Medicaid, could have significant implications for older adults. Until we are able to evaluate the bill more comprehensively, here are a few initial details we can share about the Senate’s approach to ACA repeal and replace and Medicaid reform. Roll back the ACA’s individual mandate for insurance coverage. Follow the House plan to change the age-rating for premiums, which means that states could allow insurance companies to charge older consumers up to five times more for insurance coverage. Maintain the ACA’s approach to provide income-based subsidies to buy individual insurance on the marketplace, but rolls back those subsidies and eliminates them for people making over 350 percent of the federal poverty line (FPL). Under ACA, subsidies are available for people making up to 400 percent of FPL. Maintain the House approach to repealing the ACA’s taxes on higher-income earners and insurance companies—revenues which currently pay for Medicaid expansion and extending the solvency of Medicare. Phase out Medicaid expansion more gradually than the House bill, but include deeper cuts to Medicaid in the long-run. Eliminate the Prevention and Public Health Fund. Maintain some protections for patients with pre-existing conditions by not allowing states to roll back the requirement that insurance plans cover Essential Health Benefits. However, the bill would give states the option to apply for a waiver to determine what is considered an Essential Health Benefit, and therefore could still jeopardize coverage for people with pre-existing conditions. Provides initial funding certainty, through 2019, that the federal government will pay cost-sharing payments to insurance companies that limit out-of-pocket costs for low-income consumers. Uncertainty about whether the Trump Administration would continue to pay these subsidies to insurance companies has caused significant turmoil in the insurance market. Allow states to choose between a per-capita cap or block grant structure to receive federal Medicaid funding. Cut Medicaid more deeply than the House-passed bill. Because the Senate bill would index the federally guaranteed rate of growth for Medicaid funding to a more constrained measure than the House bill, federal funding to states would grow even more slowly over time. This would ultimately shift more costs to states than the House bill, which could jeopardize critical long-term care services for older adults. The CBO will have to weigh in about cost and coverage implications for the Senate Better Care Reconciliation Act. An estimate could take a day or two, but ultimately, it will be difficult for advocates to evaluate exactly what this proposal will mean for older adults on the Marketplace and Medicaid. Last month, the CBO estimated that the House bill would cause 23 million people, including 14 million (17 percent of) Medicaid beneficiaries, to lose health insurance coverage over the next 10 years and significantly increase costs and reduce coverage options for poorer, sicker and older Americans. While the CBO estimated that the current version of AHCA would cut $834 billion—or nearly 25 percent—from Medicaid over ten years, we anticipate that the Senate plan may mean even deeper cuts to Medicaid. n4a remains opposed to the approaches taken by both the Senate and the House to repeal and replace the ACA and restructure Medicaid, which is a critical health and long-term care safety net for low-income older adults and caregivers. We continue to encourage Congress to take the time to address the key issues raised in our January 2017 Policy Brief. See our new grassroots advocacy tools to help #SaveMedicaid! The Illinois Department of Healthcare and Family Services (HFS) is transforming its current managed care program. HFS intends to extend its Medicaid managed care program into every county in Illinois beginning on January 1, 2018. HFS has recently issued a Request for Proposal (RFP) with the intent to award contracts to no fewer than four (4) and no more than (7) qualified, experienced, and financially sound Managed Care Organizations (MCOs) to enter into risk-based contracts for the Medicaid managed care program. The program will expand managed care coverage to additional populations including special needs children and children under the care of the Department of Children and Family Services (DCFS). Through this transformation, more than 80 percent of Medicaid beneficiaries will transition into a managed care health plan, an increase from the 65 percent who are currently enrolled in a managed care health plan. HFS recognizes that providers are an important part of the overall transformation process. HFS encourages providers to begin contract discussions when MCOs are reaching out to establish networks. Providers who have contracted with MCOs that are awarded a contract will be able to seamlessly serve Medicaid participants during this period of transformation. In addition, the only way for providers to ensure payment for services rendered to clients enrolled with MCOs under the transformed Medicaid Managed Care Program is to contract with the MCOs. The RFP webpage can be accessed for additional information including the draft model contract and also includes Frequently Asked Questions. Continue to visit the Medicaid Managed Care Program RFP webpage for updates, including contract award notices and transformation timelines. Thank you for your continued support of the Illinois Medicaid Managed Care Program. Molina HealthCare of Illinois MMAI will no longer provide coverage through the Medicare-Medicaid Alignment Initiative (MMAI) program after April 30, 2017. However, you will still have Medicare and Medicaid benefits, including prescription drugs. You will be automatically enrolled in the regular Medicaid fee-for-service program. Unless you make another choice, you will be automatically enrolled in the Original Medicare fee-forservice program and a SilverScript Insurance Company Medicare Part D prescription drug plan effective May 1, 2017. If you do not want to be automatically enrolled in Medicare coverage, you have options, which are listed below. Company Medicare Part D prescription drug plan. You can enroll in a Medicare Advantage health plan to get your Medicare services. A Medicare Advantage plan is offered by a private company that works with Medicare to provide benefits. Medicare Advantage plans cover all services that Original Medicare covers and may offer extra coverage such as vision, hearing, or dental. Most include prescription drug coverage as well. If you choose a Medicare Advantage plan, check with your current providers to see if they are part of the new plan. You should also ask the new plan to see if your current medications will be covered. You can call the new plan or look at the plan’s provider directory and prescription drug list online. Insurance Program at 1-800-252-8966, or 1-888-206-1327 (TTY) Monday through Friday between 8:30 a.m. and 5:00 p.m.
No matter what choice you make, you will still have Medicare and Medicaid benefits, including prescription drugs. Weigh in on ACA Repeal Next Week! As covered in our January 18 Legislative Update to members, one of the largest issues facing Congress right now is how exactly to repeal the Affordable Care Act and what exactly to replace it with (and when!). n4a’s recent Policy Brief, entitled “What Would ACA Repeal Mean for Older Adults, Caregivers and the Aging Network” details some of the programs at risk and issues at play. The Brief concludes with a list of questions for advocates to use when working with policymakers on any replacement legislation, as it’s important for all aging advocates to vocalize our concerns about ACA repeal. As a first step, the Leadership Coalition of Aging Organizations (LCAO), of which n4a is an active member, is hosting two call-in days next week, sharing a toll-free number for all advocates to use to reach their Senators and Representatives. n4a encourages you to reach out to Congress on Tuesday or Wednesday (Jan. 31 and Feb. 1) and SHARE THIS ALERT WIDELY in your community to drive more calls. 1. STEP 1: On Tuesday or Wednesday, call 866-426-2631 and enter your zip code to be connected to your Senators’ and Representative’s offices. Tell your Member of Congress why certain provisions in ACA are so important to older adults, people with disabilities and caregivers in your community! Here are some key talking points you may wish to use, but feel free to personalize your appeal with your own professional or personal experiences with the provisions in ACA that are critical to helping older adults, to mention local aging programs supported by the ACA or otherwise adapt your message. Maintain successful programs in ACA that help seniors stay healthy, such as falls prevention and chronic disease self-management programs (funded by the ACA’s Prevention and Public Health Fund), care transitions innovations and multiple rebalancing efforts that create more home and community-based services. Preserve Medicaid and Medicare for current and future older adults and people with disabilities. Medicaid is the primary public source of funding for long-term services and supports and older adults and people with disabilities account for two-thirds of Medicaid spending. Program cuts, along with block grant or per capita cap proposals, would hurt people who have no alternative means of paying for essential services. 2. STEP 2: Engage your community! Please encourage your providers, advisory boards and partners, and consumers to take action by reaching out to Members in the House and the Senate today! Thank you for your advocacy on this important issue! There will be more to come from n4a as ACA repeal and replace measures advance in the coming weeks and months.